Item Number : 02362Feature : HONEY OAK 2PC DRAWERS FOR 2359Dimens.. Item Number : 02410Feature : 39" SPRING LINK(#1-UN456-2)Dimension.. Item Number : 02508Feature : QUEEN RAIL W/CONNECTION (BOLT)Dimens.. Item Number : 02556Feature : ESPRESSO TRUNDLE FOR 2554Dimensions .. Item Number : 02557Feature : ESPRESSO 2PC DRAWERS FOR 2554Dimensi.. Item Number : 02574Feature : DRAWER FOR 2570 BUNK BEDDimensions :.. Item Number : 10980AFeature : KIT- WILLOUGHBY BLACK LOFT BEDDimen.. Item Number : 11853Feature : TRUNDLE FOR 11850Dimensions : 7..
Model Number: 300182QFDimensions:Width: 60.75 x Height: 48..
Model Number: 300186QFDimensions:Width: 63 x Height: 54.25..
Model Number: 300190QFDimensions:Width: 60 x Height: 47.. Fabric Color GREYMetal Finish BLACKDescription	&nb.. Fabric Color BEIGEMetal Finish GUNMETALDescription	..
Wood FinishWHITEDescription	Width	Depth	HeightDAYBED	79.25	42.25	39.25.. Item Number : 30463BKFeature : TWIN METAL TRUNDLEDimensions :&nbs.. Item Number : 30463BUFeature : TWIN METAL TRUNDLEDimensions :&nbs.. Item Number : 30463SIFeature : TWIN METAL TRUNDLEDimensions :&nbs.. Item Number : 30463WHFeature : TWIN METAL TRUNDLEDimensions :&nbs.. Item Number : 30468BKFeature : FULL METAL TRUNDLEDimensions :&nbs.. Item Number : 30468BUFeature : FULL METAL TRUNDLEDimensions :&nbs.. Item Number : 30468SIFeature : FULL METAL TRUNDLEDimensions :&nbs.. Item Number : 30468WHFeature : FULL METAL TRUNDLEDimensions :&nbs.. Item Number : 30623Feature : TRUNDLEDimensions : 74" x 40" x.. Item Number : 30624Feature : DRAWERSDimensions : 37" x 24" x.. 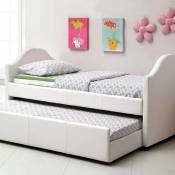 Item Number : 37008Feature : CHERRY TRUNDLE FOR 37005Dimensions :.. Item Number : 37078 KITFeature : CUTIE WHITE FINISH TRUNDLEDimens.. Item Number : 37472Feature : TRUNDLEDimensions : 75" x 40" x.. Item Number : 37693Feature : TRUNDLE @NDimensions : 75" x 41.. Item Number : 38027Feature : TRUNDLEDimensions : 75" x 40" x..
DAYBED39090DIMENSION: 80" x 42" x 37"HFEATURE: Antique Oak FinishPackage:- ..
DAYBED39095DIMENSION: 82" x 42" x 39"HFEATURE: Black FinishPackage:- See mo.. Item Number : 39097Feature : BLACK TRUNDLEDimensions : 76" x.. Item Number : 39102Feature : TRUNDLEDimensions : 76" x 41" x..
Wood FinishCOUNTRY BROWNDescription	Width	Depth	HeightTRUNDLE	74.75	41.75	1.. The multi-functionality of a daybed provides a level of flexibility that ma..
Classically styled for your traditional home, the Lorena Collection is offe..
Metal Finish BLACKDimensions66 "L x 7 "W x 3 "H..
A classic look is offered to meet the sleep and relaxation needs of your ho.. DETAILS: Aelbourne Black PU Wood Daybed & Trundle - By Acme FurnitureDI.. Completely do away with the need for case good and open up the room for act.. The black vinyl covering of the Homelegance Adra Collection blended with cl..
Modern traditional styling plays well with the décor of your home in the A..
B743 Realyn Twin Day Bed StorageCONSISTS OF:Twin Day Bed Inches: 79" W..